Lianne and Joshua Mandelbaum never step on an airplane without six vials of injectable epinephrine and a bottle of liquid Benadryl. 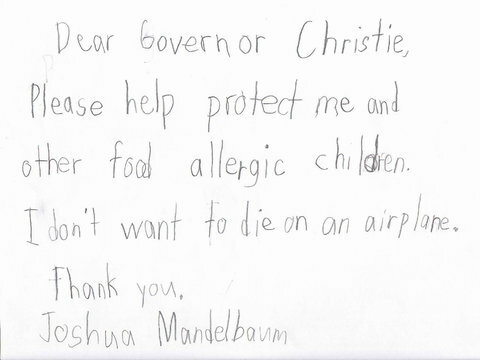 That’s because Joshua, who is 8 years old, is deathly allergic to peanuts. If exposed to them, he can go into anaphylactic shock. But even with the injectable epinephrine, he needs to be rushed to the hospital for emergency care. This makes flying scary; there aren’t many long-term medical options at 35,000 feet in the sky. So before Joshua even leaves the airport waiting area, his mother asks to board the plane early to wipe down the seats, tray tables and windowpanes in their row. She also requests the flight attendants make an announcement asking other passengers to refrain from consuming products with nuts. This is a common practice among people with nut allergies, as a study in the March 2013 issue of the Journal of Allergy and Clinical Immunology reports.